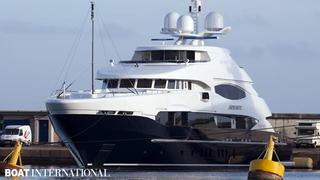 One of the first deliveries of 2012 arrived on the French Riviera a couple of days ago. She's a 55 metre displacement Heesen yacht built in steel and aluminum, previously known as hull number 15555 and now called Serenity. Launched in November 2011, Serenity has naval architecture by Heesen Yachts and Van Oossenen & Associates, and her exterior design is by Omega Architects. Serenity offers an impressive interior volume, which is, according to the yard, '50 per cent more volume than most 50 metre yachts'. With a gross tonnage of 850GT, the yacht's accommodation is split over four decks. Features include a full-beam upper deck and two distinctive side balconies forward on the main deck. The Heesen 55m series is designed to sleep 12 guests in 6 cabins, but no details about her layout have been disclosed. Powered by twin MTU engines, she reaches a top speed of 15 knots and has a range of 6,000 nautical miles at 10 knots. Currently lying at the IYCA in Antibes, this Heesen flagship is now ready for long cruises with her owners.